3 bedrooms, 3 baths, approx 2510 sq. ft.
3 bedrooms, 2.5 baths, approx 2364 sq. ft.
5 bedrooms, 2 baths, approx 2896 sq. 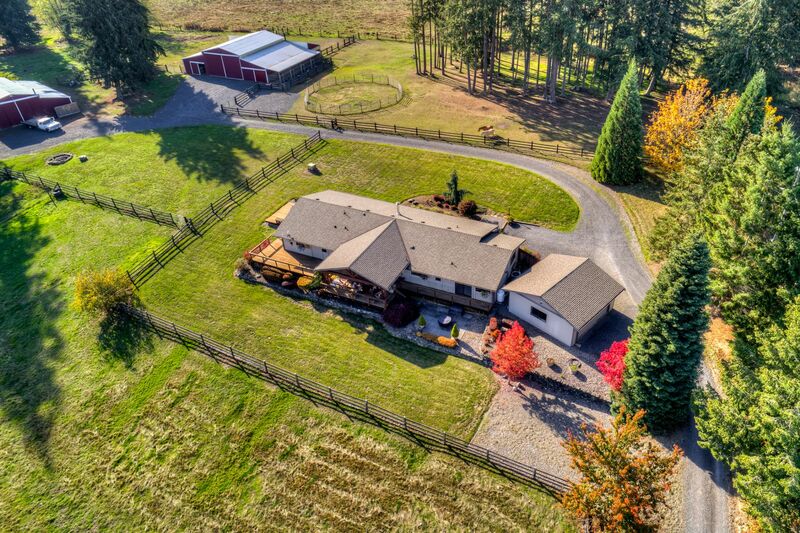 ft.
20.85 acre horse ready property available in the Lacamas Valley area off 8th Avenue South in Roy WA Parcel number 0317082030 which is NOT in the transit tax area Located 10 minutes from East gate JBLM, and convenient 25 mile commute through Yelm to the city of Olympia. Private drive off a paved public road leads you to ideal privacy. This unique property displays incredible Mount Rainier and territorial views that include incredible sunrises and sunsets. One story well maintained ranch-style 3 bedroom, 2.5 bath home that has been quality updated with features detailed below. There is a detached two car garage that services the home, 70 X 80 Barn and 48 X 38 heated and insulated shop with storage loft. The pastures are cleared, cross fenced for five separate pastures and entirely usable for year round grazing. A Dogwatch hidden fence system is installed to enclose approximately 3 acres. For additional information on this property click here. Information provided is for viewer's personal, non-commercial use and may not be used for any purpose other than to identify prospective properties the viewer may be interested in. All information is deemed reliable but its accuracy is not guaranteed and the viewer should independently verify all information.